I find that whitewater river boating precipitates some of the most intense experiences to be had in the outdoors. This is really true whether one employs a raft, a kayak, or a canoe. Unlike rock climbing, where the action takes place almost in slow motion, whitewater boating seems rip-roaring fast. Decisions often have to be made in the blink of an eye, and paddle strokes must come forth way before conscious thought. Having lived in Hawaii, I am drawn to also make comparisons with ocean surfing. Ocean surfing is 99% paddling and 1% riding, but whitewater kayaking in swift water is closer to 100% riding. Big river waves and hydraulic features allow one to surf for extended periods of time compared with even the longest ocean slides of say Waikiki Beach. Indeed, I have inadvertently surfed river holes for longer than ten minutes! The sport is also extremely accessible to those of all ages and even those suffering from many disabilities. Whitewater was a major preoccupation for me in college, and I was a whitewater guide on the New and Gauley rivers in West Virginia in 1996. After a very long hiatus, I thankfully was able to get back into the sport recently. Mom and Dad being great sports as we slide into Surprise Hole at the upstream end of the gorge proper. The Eastern and Southeastern parts of the U.S. contain mostly low volume whitewater streams that in paddler's terms are often "bony," due to ubiquitous shallow rocks. The New, in contrast, is BIG water. Its volume is often much greater than that of the Rio Grande as it flows through the Grand Canyon. At all but the lowest water levels, this volume breeds big waves in long wavetrains and massive hydraulic features in what is surprisingly forgiving environment. This video shows footage from a recent trip to the New River with my old river buddy, Cary Kanoy. 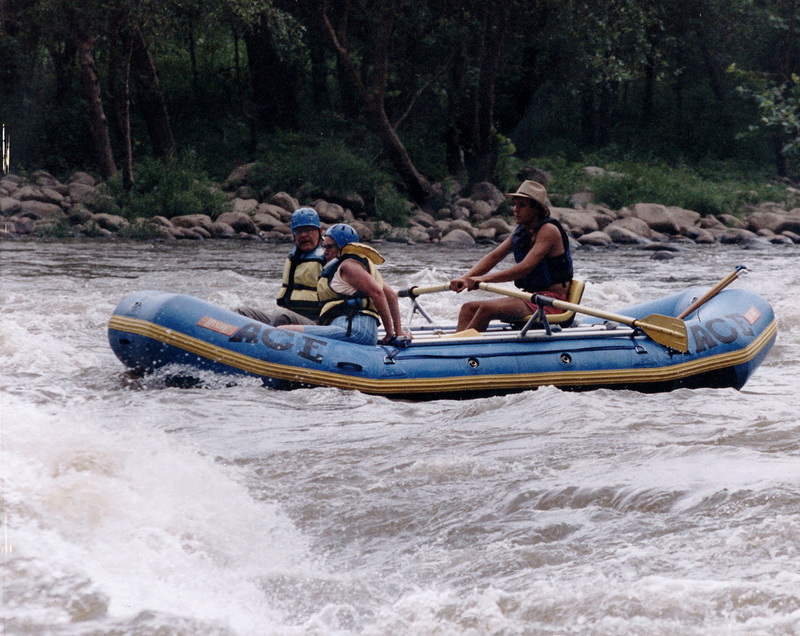 Cary is shown in the low-volume blue kayak, and I am in the yellow inflatable kayak. As you can see, Cary is a professional level rodeo-style boater. The BIg South Fork is a southern gem of a stream which crosses the Tennessee/Kentucky border not far from Interstate 75 and the travesties that are Dale Hollow and Lake Cumberland. The drainage offers more than 70 miles of boating within park borders. It includes everything from tight technical "creek-style" boating for kayaks to big open water and class two rapids for canoes on overnight trips. The camping is great. The fishing is good. And the place is virtually deserted a good portion of the time. The only "catch" is that one has to time the water well in this completely free-flowing drainage. Water levels, and thus conditions, can change quickly. Also, be careful to take full precautions against bears! The critters seem to have the full run of the place.